Discussion in 'The Lounge' started by srbeck, Oct 6, 2005. I guess he likes a shorter wheelbase. Some people get real confused with reverse arch forks eh? Did you leave him a note? I'm think more , of you relize how easy it is to cut that cable ? You should ask him if ever takes that bike off of some cool jumps. Note to self, never sit on you bike when installing brakes. The sad thing is that is probably how the shop set it up. I bet you it was a box-n-ship job, and "I don't need a shop to reassemble it". 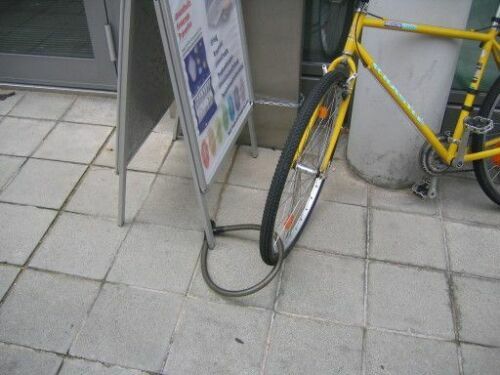 I am guessing this is a college genius, hence the $2000 bike and the $5 cable-lock system. Also zero dirt on the bike (not that the person would survive riding with the fork turned backwards). 2.) Um, yeah, I hope it's obvious by now. "hmm, strange that the dropouts are in the back, but I guess they knew what they were doing." -- Just wondering, how much does that actually weaken the design or effect the riding? I've never done that, so I really have no idea. I would think worst case scenario is that if he pulled the front brake with all four fingers he is going over the bars. The tangential force would be directed down and since that force is in front of the axle...well you can see the potenial. I would think the dropouts would still perform relatively the same?!? well because the rotor and wheel are moving forward, if he suddenly grabbed the front brake for whatever reason at a high speed there is a good chance that the front brake could get ripped off due to the forces being exerted on it. whether this is true or not i really am not sure but it does make sense from a physics standpoint. He / she would probably come out later in the day to get their bike and wonder wtf their fork was on "backwards". Some people are idiots. "Well, the stickers are backwards, the crown is backwards, the dropouts are backwards, and the caliper is on the front of the fork, but I MUST be right because the arch is forwards!" Outside magazine made this mistake in their buyers guide with a Blur and a Minute. It made me cry. I think Manitou should just put a little sticker on the top of the arch with an arrow pointing to the front. "This side forward". btw, it's nice to live in a country where you can openly slam the leader and not be chopped up into little pieces and fed to your family. fixed to a URL; apparently that site doesn't allow offsite linking. i wouldn't have it any other way. btw, america's hardly alone in that category. and i'm curious about yr "openly slam the leader" comment, when you couldn't see what i linked to. that behaviour is reminiscent of religious whack jobs who burn books/boycott movies they've never read or seen. So typing:"doesn't negate the fact that he's capable of such blunders"
is not openly slamming him? Tell me your point if I was wrong. btw, religious wack jobs? Really? so you prefer yr leaders to be infallible, immune from ordinary human foibles? keep searching. I thought Bill Clinton filled that roll. which is worse, a BJ or a war fought under false pretense? I have received a few really lame hummers before. I'm going with a BJ. this is my political agreement for the week. 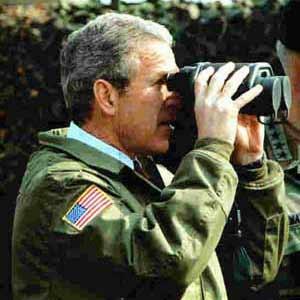 Name a war that was not fought under false pretense. No way, they put decals on the back of the legs so you can see them while you're riding and never forget what kind of forks you have. from yr deflection of my earlier query, i suppose you do take more umbrage @ the stained dress incident than the current disaster ongoing in iraq?